It’s an intense situation that anyone who gets excited about food has been through: you’re out at a nice-ish restaurant for the first time, you’re waffling between two or three dishes, and you just can’t make up your mind. You can’t even fully participate in the conversation until you get your order figured out. You might as well be playing on your phone for how much attention you’re paying to your dinner companions. You want to try everything! It all sounds so good! And you know you’re not going to be making it back to the restaurant any time soon. What if you choose the wrong thing?? Oh, the agony! Luckily for me, my husband and I frequently have the same tastes, with a few exceptions. For instance, he’s not a big dessert fan, and he doesn’t like chocolate. On one hand, this (ahem, weird and inexplicable) aversion means that I don’t have to share anything chocolate with him. When I order that fudge tartlet at the end of the meal, it’s all mine. On the other hand, this means that I don’t get to share anything chocolate with him… That batch of homemade cookies…it’s all mine. Every last one of them. I will end up eating every single cookie that doesn’t get given to friends or taken to work, because my husband will not touch them except to ask me to set aside some of the dough for him before I add the chocolate chips to it. So, this throws a bit of a wrench in baking at home, especially during Snowzilla when you’re stuck inside and not pawning off your extra cupcakes and brownies on unsuspecting friends and coworkers. As I was stocking up for the blizzard, I actually went about it with the intention of not baking anything and contenting myself instead with mugs of Smitten Kitchen’s hot chocolate (sometimes spiked with bourbon). That mindset lasted for about two days, and then I started second-guessing my strategy and figuring out what spouse-pleasing dessert I could make with what we had. I settled on flan pâtissier, which is essentially a super-thick—as in, sliceable—custard cooked in a pie crust. (Not the same as Spanish-style flan.) I’m not going to lie, it’s a bit strange. In my (American) opinion, it’s not as sweet as most things you’d categorize as a dessert, but I noticed that many of the French reviewers of the recipe I followed commented that they had cut back on the sugar. The texture is unusual, too: it’s creamy, but imagine a cross between a pastry custard and a vanilla Jell-O jiggler. I remember trying flan pâtissier in France and not being blown away by it; in fact, this article by Ann Mah pretty much sums up my lackluster reaction to it. So why revisit it if I thought it was just okay? Well, first of all, it didn’t require trudging through 2 feet of snow to the nearest grocery store to pick up new provisions because it uses ingredients that are very basic: flour, butter, sugar, milk, eggs, vanilla, and cornstarch. Second of all, knowing what to expect is important, and I think I was imagining that it would be like a slice of crème brûlée when I first tried it. It’s not. It looks richer than it tastes. Don’t go into it thinking that it will be soft and spoonable like most custards or flans available in the USA, or you will be disappointed. It is also noticeably less sugary than anything that qualifies as a “pie” in the States. Know that you’re supposed to wind up with something pretty firm, and know that is mildly-flavored. Third, I really enjoy most dairy-based treats. Lastly, my husband will actually eat desserts like this. I searched some French cooking websites to find crust and filling recipes; the crust turned out great and didn’t get soggy even without blind baking, and the vanilla filling was smooth and creamy. If I had chosen this flan pâtissier in a bakery (and probably suggested going halfsies on an almond croissant too), there would would been some high-fives after ordering. Note: This was my first attempt making flan pâtissier, and there are a few things I’d consider changing the next time around, like trying a parchment-lined 9″ cake pan instead of a springform pan. (The recipe didn’t specify what size pan was needed.) I don’t usually cook with vanilla beans—we happened to have one that was probably 3 years past its prime—so I would also be interested to see how it would turn out without the vanilla bean, and rely instead on adding the vanilla extract and a tablespoon of rum (suggested in many comments) after the custard thickened. I might also pass the thickened filling through a sieve before baking it. The pâté brisée recipe comes from Meilleur Du Chef (which I just realized has an English version, although it’s still in metric), and the flan pâtissier was adapted (barely) from the recipe submitted by Eryn Folle Cuisine on Le Journal Des Femmes. Preheat the oven to 350º. Butter and flour a 9 1/2″ springform pan. Roll out the chilled pie crust into a 14″ circle and mold in into the pan, going about 2″ up the sides. Prick the bottom and sides with a fork, and let chill in the fridge while you prep the filling. In a large bowl, beat 1/2 cup of the milk with the eggs, sugar, salt, cornstarch, and vanilla extract. In a saucepan, heat the remaining 3 1/2 cups milk and the scrapings from the vanilla bean over medium heat. When the milk just starts to simmer, remove the pan from the heat but don’t turn off the burner. Very, very slowly add the hot milk to the egg mixture: beat the egg mixture constantly and add a few drops of hot milk at a time until you’ve incorporated about a cup of it, then add the rest in a slow stream, continuing to beat constantly. Return the mixture to the pan and heat over medium, whisking constantly until thickened. Pour the filling into the crust (no need to blind bake the crust), and cook for about 40 minutes. Turn the heat up to broil, and broil for 1-3 minutes to color the top. Keep an eye on it so it doesn’t burn! Let cool for a bit at room temperature, then place in the fridge and let chill completely before removing from pan and slicing. cold water, about 4 Tbsp. Mound the butter/flour mixture into a little mountain shape again. Put the egg yolk in the center, and—working from the middle of the bowl to the edge—use your fingertips to gradually start incorporating the yolk into the flour/butter mixture. Add water, 1/2 Tbsp. at a time, to help the dough come together. (I added about 3 Tbsp. total.) Avoid working the dough too much. Once you can gather it into a ball, flatten it into disk, cover with plastic wrap, and let chill for at least 30 minutes. And the second is seeing what happened in the garden while we were gone. I am like those proud aunts who exclaim “The last time I saw you, you were only this big!,” only I’m saying it to my squashes and peppers. I mean, we got home at 11:30pm and I was literally out there with the flashlight app on my phone, knowing it was too dark to see much but not being able to resist a quick glance through everything. I had asked a friend to help herself to anything that ripened while we were gone, but when I really checked out the garden in the daylight, would I find any new baby watermelons? Did everything survive? Would there be anything that was ready to pick? The answers, as I discovered the next morning, were: Yes, Mostly, and How did I not see that zucchini before I left? Did it seriously grow a foot and a half in a week? Summer squashes are better when they’re on the smaller side; they can get bitter and tough when they get too big. Being practically incapable of getting rid of produce simply because it’s past its prime, though, I couldn’t toss this monster directly into the compost bin. He would just have to be grated and cooked into submission. 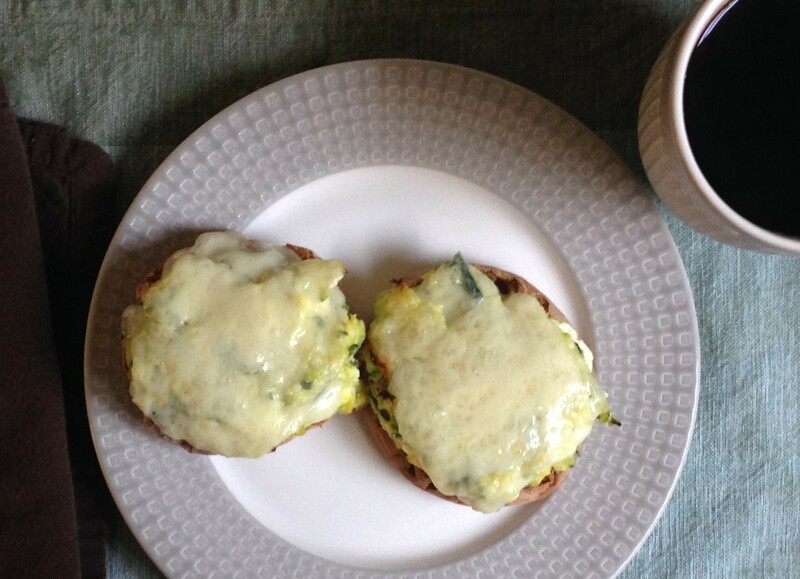 “Zucchini eggs,” as I uninventively call them, have been a summer brunch staple for 5 or 6 years now. They are one of my favorite weekend breakfasts because they taste awesome. Oh, also, they’re easy and quick, and I usually have all the ingredients on hand. And, unlike some brunch fare, they don’t put you in a food coma or make you feel like you don’t need to eat for the rest of the day. Basically, you sauté some zucchini with a bit of garlic, crack an egg into it, and scramble it all up. The trickiest part is forming it all into a couple of patties, which you then place on a toasted English muffin, top with some cheese, and pop in the broiler for a couple of minutes. 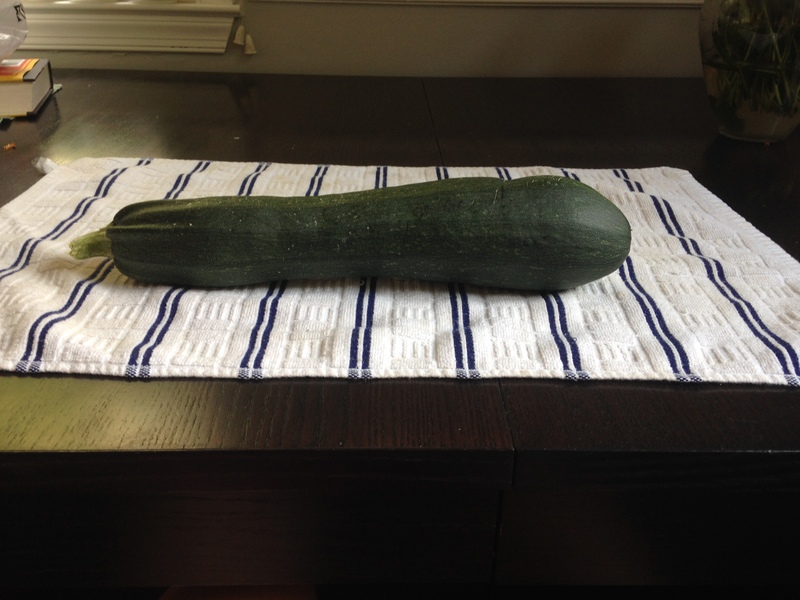 It’s better with normal-sized zucchini, but if you have a gargantuan one to use up like I did, it works just fine with those too. Note: You can double this recipe, and I have successfully tripled it before, but I wouldn’t recommend doing more than doubling it. It just gets too unwieldy in the pan. Have a small baking sheet ready. You will also need a silicone-coated or wooden spoon and a small flexible spatula (the pancake-turner kind). Turn the oven on 350º and put your English muffin halves directly on the oven rack to toast. 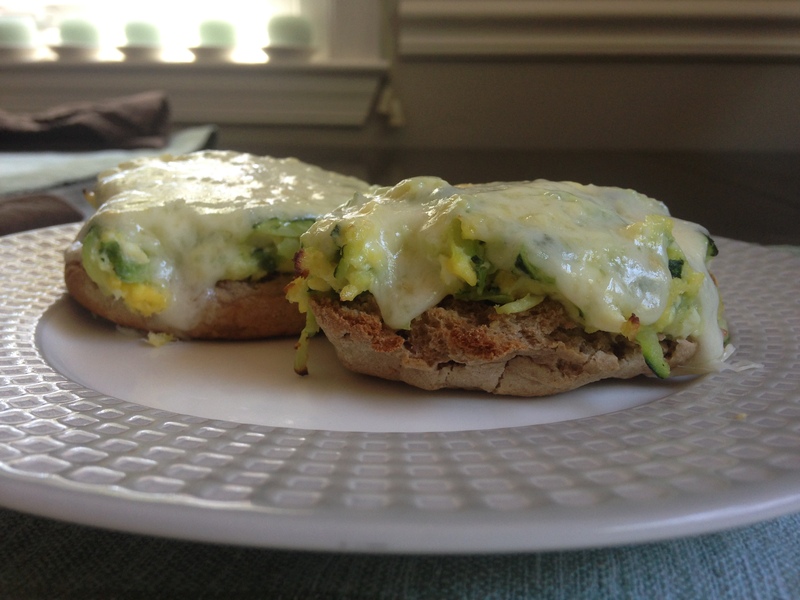 No need to preheat the oven; the muffin will toast slowly as you make the zucchini and egg. Heat the olive oil in a medium pan to just over medium heat. 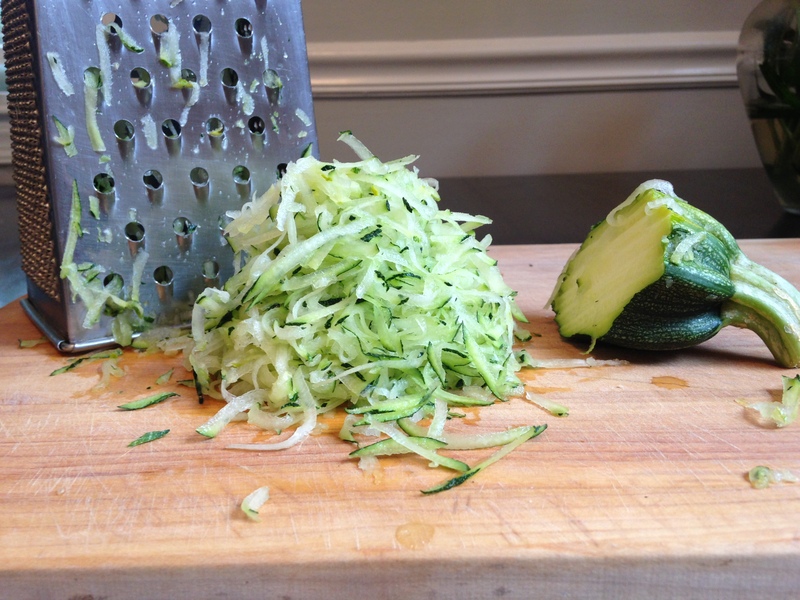 When the pan is hot, add the zucchini and a pinch of kosher salt. Cook, stirring occasionally with the spoon, until the zucchini has started to release its water. Stir more frequently until the water has evaporated. Add the garlic and stir until fragrant, about 30 seconds. 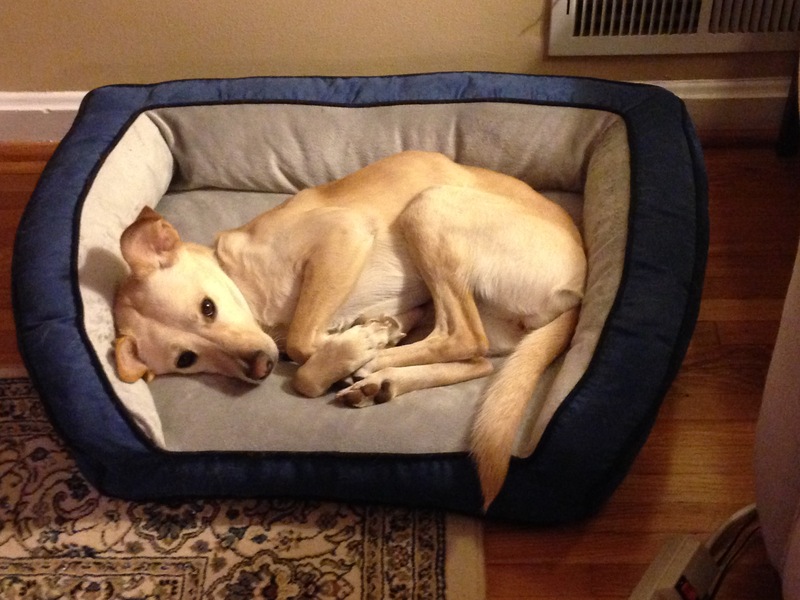 Turn the heat down to medium-low. Check your muffin. Mine is usually done toasting now. Take it out of the oven and place it on the baking sheet. Turn the oven up to broil. Crack the egg directly on top of the zucchini, break the yolk, and mix it all up really well. Stir frequently with the spoon so that it cooks relatively evenly. Add a little more salt if you want. When the egg starts to dry out enough to hold some shape, separate the mixture into two mounds, mold them into patties that are roughly English muffin-sized, and let them cook a little on one side. Flip the patties once with the spatula, and continue cooking until the eggs are done. Place the two patties on the toasted English muffin and top with the sliced cheese. Broil until the cheese is melted, just 1 or 2 minutes. I did not make this (sort of) frittata from (mostly) egg whites because I wanted it to be healthier and threw away all the yolks. (That will happen after I enjoy holiday food.) No, it has mostly egg whites because I had a ton of them leftover after making lemon curd, pastry cream, and tart crusts. Why the glut of decadent desserts? Well, I’m not above bribing my students, so every year between Thanksgiving and Christmas, I give them raffle tickets when they participate, and then we have a drawing for prizes on the last day of class before winter break. This year, tartlets, eclairs, madeleines, and—the most prized possession of all—homework passes were in the mix. After the frenzy of baking, I made a mental note to collect money from my classes next year and buy treats from a local bakery in order to maintain my sanity. And then I tried to figure out what to make with the 7 egg whites and 1 whole egg (it didn’t want to separate nicely) that I had. Anything sweet was out of the question because I was on a sugar overload after all those bowls and beaters that I had licked, so a frittata seemed like the best way to go. And, as the title says, it’s not really a “frittata” because it’s cooked entirely in the oven and not at all on the stovetop. I supposed you could call it a “crustless quiche,” but “crustless quiche” makes me feel the same way a lot of people do when they hear the word “moist,” so I’d prefer to misname it a frittata. 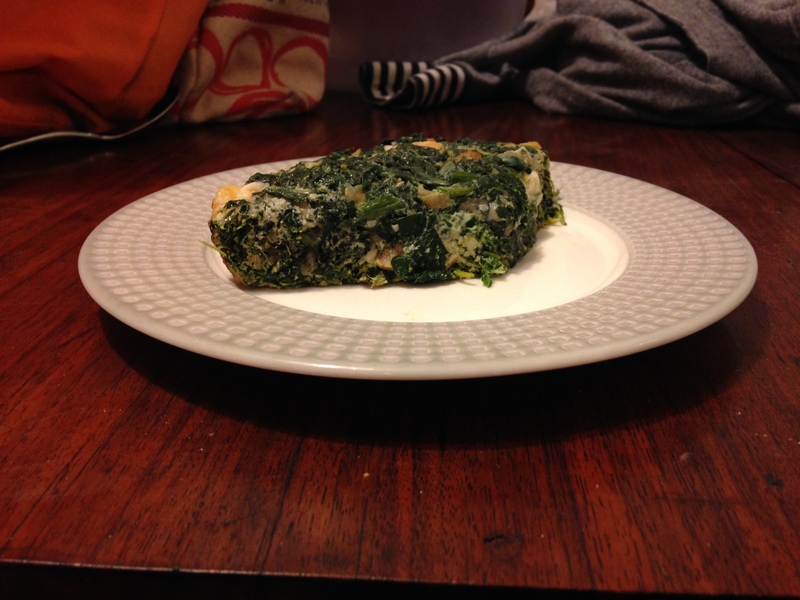 Also, it’s cooked in a cast iron pan, which is not nearly dainty enough for anything that calls itself a quiche. I make frittatas pretty frequently; I usually use whole eggs and keep it vegetarian. I was afraid that the egg whites would make it bland, though, so I fancied it up a little more than I usually would. First, I found some Trader Joe’s chicken breakfast sausage links in the freezer, so I browned up a couple of them to add. Next, I harvested all the kale in the garden that’s threatening to die every time a frost comes around. 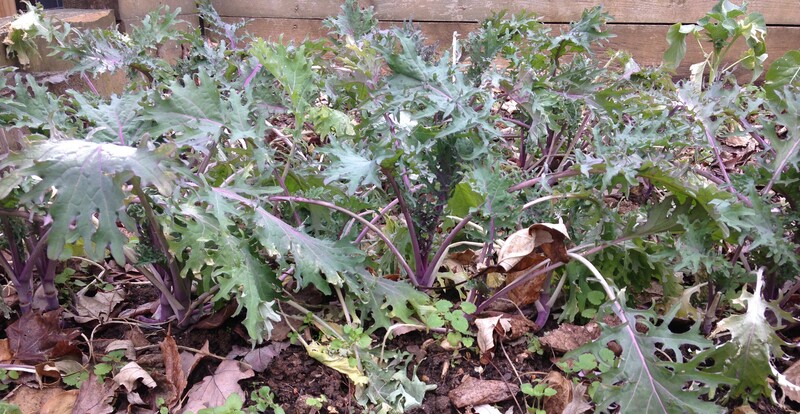 It’s Red Russian kale, which supposed to be very cold tolerant, but it looked like it might be on its last leg. I like my frittatas with a lot—and I do mean a lot—of vegetables. Even though my pile of kale was overflowing the salad spinner, it barely weighed 8 ounces, so I decided to use all of it. Next, I usually just toss in some raw onion, but I caramelized half of a yellow onion instead. Finally, for the cheese, we had provolone but, oddly enough, it was a really nice provolone that was quite strong, and I found it to be almost overwhelming. So, I used just a bit of it and added some mozzarella for gooeyness and to let the other flavors come through. Note: I was double-checking the size of the skillet I used, and it says 5 on it, but it was about 7″ in diameter. And so I learned that the numbers on cast iron skillets correspond to certain standard pan sizes, not the actual diameter in inches of the pan. You could make this in the same size pan with 4 whole eggs instead of egg whites. Also, my 8 oz. of kale didn’t need to be de-stemmed. If you have to de-stem your greens, you might want to start out with more than 8 oz., or just weigh them after you stem them instead of before. For the sausage, I used 2 links of breakfast sausage, and they weighed about 2 1/2 oz. before I cooked them. Lastly, this frittata reheats nicely in the microwave and will keep well for a day, but after much longer than that, the cheese will start to take on an unpleasant texture. Preheat the oven to 350°. Add 1 tsp. of the olive oil to a #5 (6.75″) cast iron skillet, and put it in the oven to warm up while you prep everything else. Heat the olive oil in a stock pot over medium heat. When it’s warm, add the minced garlic and stir until just fragrant, 30 seconds or so. Add a handful of the greens and a couple of healthy pinches of kosher salt and stir until the greens start to wilt. Keep adding greens by the handful until they’re all in the pot and are completely wilted. Remove from heat and let cool. This will happen faster if you put them in a different bowl instead of leaving them in the pot. While the greens are cooling, caramelize the onion. First, heat 1 more tsp. of the olive oil with the 1 tsp. of butter in a small pan over over medium-high heat. Slice the onion thinly crosswise. When the pan is hot, add the onion and a pinch of kosher salt and cook, stirring constantly, until the onion is soft and translucent, about 3 minutes. Turn the heat down to medium low and keep cooking, stirring regularly, until well-browned, about 10-15 minutes more. Remove from heat. Dice the cheese into 1/4″ to 1/3″ cubes. You could grate it, but I like how it doesn’t disappear into the frittata if you leave it chunkier. By this time, your greens should be cool. Squeeze them out as much as you can. Seriously, put some muscle into it and get them as dry as you can; otherwise, it while make your eggs gross and watery. Chop up the squeezed-out greens. Whisk the egg whites and egg in a medium bowl. Add the sausage, greens, onion, and cheese. Season with salt and pepper to taste, but keep in mind that you’ve already salted the greens and the onion, and that the sausage has salt too. Use an oven mitt ! to remove your hot cast-iron skillet from the oven. The oil should be nice and shimmery. Swirl the oil around or use a spatula spread it out until it evenly coats the bottom of the pan, and then add the egg mixture and smooth the top. Cook for about 25 minutes, or until the eggs are done. 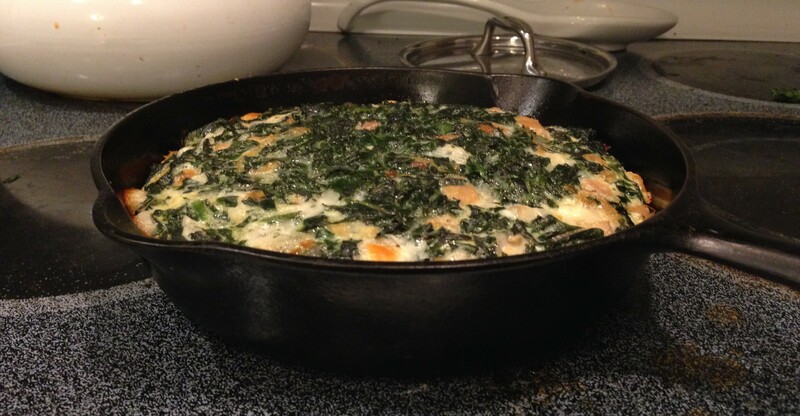 Remove from the oven and run a rubber spatula around the edges of the pan to loosen up the frittata a little. Let it cool for 5-10 minutes, then use the rubber spatula to slide the whole thing out of the pan. Enjoy immediately, or wait until it cools completely and then refrigerate it for later.